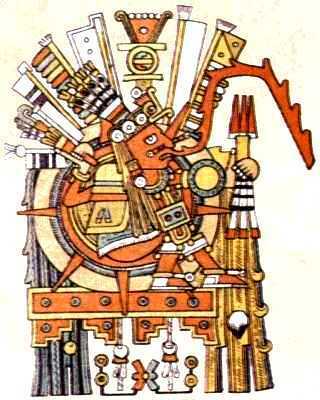 Tonatiuh is represented in the Borgia Codex with his body, face and hair of a red, igneous color. His hairs are strapped with precious stones and at the forward end of his hairpiece, there is an insertion of a slim and elegant head of a bird. There are two chalchihuitl straps adorned with eagle feathers and of the four straps that bind his hair, two protrude forward and two towards the rear. Over his head, we see a hairpiece that ends in two eagle feathers. His perforated nose carries a precious stone and from his earpiece hangs a chalchiuitl strap. A solar disk adorns his neck. His loincloth is the cuauhiuiyacamaxtlatl, whose tips are adorned with eagle feathers, as we have seen in Tonacatecuhtli and Ten Xiuhtecuhtli, God of Fire. Figures 384 and 385 of the Vatican Codex show two passages where the God is not drawn in such detail, but rather the same clarity. Its face and body are painted red, its hair of an igneous color wrapped with a belt adorned with precious stones and on his forehead, the stylized head of a bird.